This story is the third part in a four-part series about our Halfsy Hero, Melinda Soerjawitaka. Our series will follow Melinda and three other heroes as they train for the November 6th Good Life Halfsy. Melinda’s story has been full of upward momentum. More runs, longer runs, faster runs, confident runs… but right now she’s taking a break. Melinda said she’s always struggled with plantar fasciitis – the inflammation of tissue in her heel – but recently it’s gotten much more painful, limiting her training over the past few weeks. Her momentum has plateaued, but she’s praying this is only temporary. Melinda has been walking, but not running, hoping that taking a little break will help her gear up again for the early November race. It’s been incredibly frustrating, Melinda said, because she has been thinking and preparing for this race since April. While it’s been one of the biggest physical challenges of her life, it’s also been one that she’s incredibly proud to have undertaken. At the beginning of her training she couldn’t even run for 30 seconds straight, now she’s running 8+ miles at a time and loving it. She’s seen physical and emotional changes in her body as well. Melinda said she has more energy, has lost 20+ pounds and is in the best shape of her adult life. These facts are what make it hard for Melinda to stop running – she doesn’t want to lose her drive – but she also needs to take care of her body. Melinda said she thinks about what she eats and how it’ll impact her body and she is conscious about being active. Training has impacted her own life and her family, and Melinda said she’s not about to let a flair-up in her foot keep her from celebrating how far she’s come. 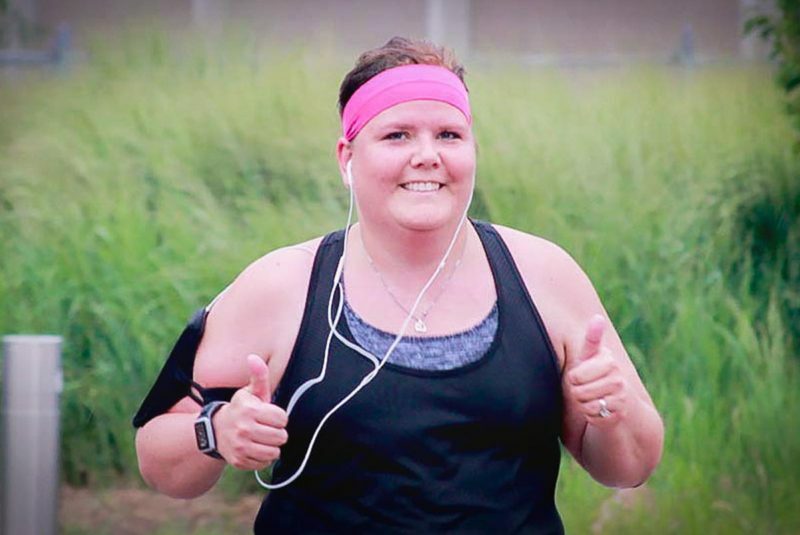 More than ever, Melinda said she’s set on crossing that finish line at the Good Life Halfsy. Whether she walks for part of the race, the whole race or finishes with a personal best – finishing is her goal. She’s talked to some long-time runners, gathering knowledge about the best race strategies and trying to be as prepared as possible for the race. She’s picked out her carb-heavy pre-race dinner and a light breakfast to give her lots of energy for the race, all she needs to do now is finish her last few weeks of training. Check back for more Halfsy Hero stories and to read the final installment of Melinda’s story.